1. 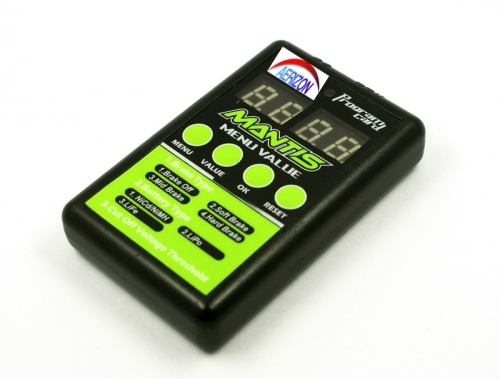 Program card with LED display is easy to use and convenient to carry. All of the programmable functions are shown on the program card. 2.Turn on the ESC. Remove the signal wire and plug it into the top-socket on the program card, wait for 2 seconds until the LED is on. 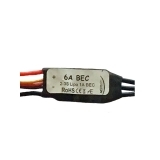 3.If ESC is not connected with the batteries, the program card should be connected with other power supply, the range of power supply is from 5.0V to 6.3V. 4.Press the button ”Menu” on the program card and circularly select each programmable function. At that time the number of programmable function will be displayed on the left of the LED, the current value will be displayed on the right side. Then press the button “Value” to change the value and press the button “OK” to confirm. At the same time the Red indicating LEDs of both program card and the ESC will blink. Turn off the ESC, the modified settings will be saved in the ESC`s memory. 5.Press the button “Reset” to restore the default settings. Durch eine konstante Entaderate von bis zu 30C ist diese wiederaufladbare Lithium-Polymer-Batterie (LiPo-Akku) insbesondere für bürstenlose Motor-Regler-Kombinationen (Brushless) geeignet, wie sie beispielsweise in Flugmodellen für Einsteiger zum Einsatz kommen.